A few years ago my younger sister married Randika, a man whose origins are in Sri Lanka. The wedding was, as I’m sure you can imagine, a colourful affair; there were plenty of beautiful saris on display – our family looked a bit beige in comparison. With two sets of proud, and let’s face it, slightly competitive parents on hand, there was little chance that the wine, or anything else for that matter, was going to run out. … which brings us back to the wedding at Cana. John’s narrative does not provide us with a lot of detail, but it is probably safe to assume that Mary knew the hosts and was known by many of the other guests – perhaps they were even family. The marriage would have been a great cause for celebration, and an opportunity for showing off – ‘Of course my son is married and has sons of his own’ – you get the picture. Mary’s son of course, now about 30 years old, is unmarried and not showing any prospects either of being married or of fathering children. He’s also started hanging around with an odd collection of men. I wonder whether Mary was feeling uncomfortable under the gaze of the other wedding guests. The younger Mary showed an extraordinary spiritual integrity in her response to a message from God. In response to the angel Gabriel, “Mary said, ‘Here I am, the servant of the Lord; let it be with me according to your word.” Thirty years on, she points to Jesus, the son promised by the angel, and says, ‘They have no wine’. Now, perhaps this was the response of a mother feeling a little overshadowed by the bragging of her contemporaries, but perhaps it was another moment of spiritual integrity. Maybe Mary discerned that this was the moment for her son to reveal God’s glory. And so she points to Jesus and says, ‘They have no wine’. I want you to turn now to the image that was circulated with your service sheets this morning. 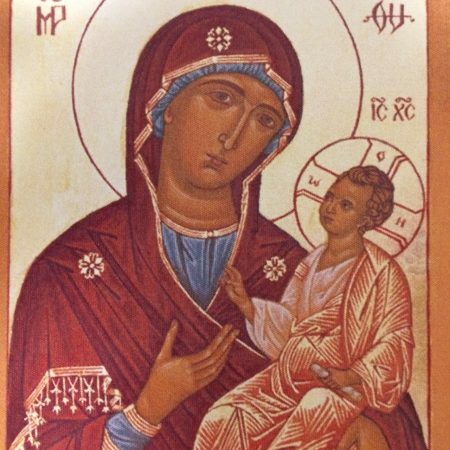 It is an icon depicting Mary and Jesus, one of a family of icons called Hodegetria, which means, the one who points the way. Just take a few moments to look at the image. Mary cradles the child Christ in her left arm, while she points to him with her right. His eyes are on her, and his right hand is raised in a symbol of blessing. Mary’s eyes look out at us. What is being conveyed in this image? What little journey around the picture are we being invited to make? Mary’s gesture towards Jesus is the pivot point of the image, the starting point of our little journey if you will, which takes us to Jesus’ eyes, to Mary’s face and out to us. Mary is introducing us to her son, whose attention is wholly focused on her. This is the Son of the Most High, heir to the throne of his ancestor David, who will reign over the house of Jacob forever, and of whose kingdom there will be no end. And yet, he is not a distant ruler. Jesus being and his loving are close at hand; engaged, intimate, directed towards Mary, a symbol of humanity. And in the image, Mary’s eyes are like a mirror for us. A mirror that doesn’t reflect our gaze, but rather a mirror that directs our eyes to the object of her pointing. Just as at the wedding in Cana, Mary wants the focus of our attention to be on Jesus. And in turn she urges us not to point to or seek attention for ourselves, but to point to him. This might sound a bit odd. It certainly jars in a culture that is self-obsessed. But self-denial, or at least not making ourselves the centre of everything is at the heart of being free; at the heart of being saved. Because by pointing to Jesus we are pointing to the one who’s loving gaze is focused on our faces. A gaze that does not look away when we fail. A gaze that lets us off the hook of being perfect. A gaze that forgives and invites us to forgive. A gaze that loves and invites us to love. At the wedding in Cana, Mary points to her son not to show off, but rather because she discerns an opportunity for him to reveal his glory. By following Mary’s gesture, and accepting her invitation to point to Jesus we see ourselves truthfully – as loved by him.